The bad news? The forces of opposition may be just as strong as he is. On the ninetieth day of Bill de Blasio’s mayoralty, the sun was out and the air warm and light, suggesting that a harsh winter was finally yielding to a gentle spring. That morning, the newspapers brought word of a state budget deal that would fund de Blasio’s signature initiative, a universal pre-kindergarten program, for five years. Because of a law de Blasio pushed, some 500,000 workers would the following day begin enjoying paid sick leave. Around the city, the number of stop-and-frisk encounters was down dramatically, and costly litigation over police stops and fire department hiring was no more. On Manhattan’s western edge, a massive real estate development proceeded with a living-wage agreement in place thanks to de Blasio’s intercession. And the city’s public housing authority was no longer (in a bizarre quirk of the budget) paying the city for police protection. Although New York has not yet been transformed into an egalitarian utopia, the tectonics of the city are nonetheless shifting as de Blasio starts in earnest on his campaign pledge to beat back inequality. Shortly after 1 pm, de Blasio strode onto the pitcher’s mound at Citi Field in Queens, home to the New York Mets. It was opening day of the 2014 baseball season, and the new mayor had been invited to throw out the first pitch. Wearing a Mets jersey and cap, he cocked his arm, released the ball—and was promptly and lustily booed. The jeers might have been nothing more than good-natured ribbing from long-suffering Mets fans for a defiant Red Sox loyalist. But the catcalls echoed what the polls say: de Blasio went from winning 72 percent of the vote in November to having a 45 percent approval rating in one March poll by Quinnipiac University. A New York Times/NY1 News/Sienna College poll in early April gave the mayor a slightly higher rating but still offered middling scores on his handling of schools, jobs and even income inequality—the issue that had propelled de Blasio to a stunning win in the Democratic primary and a landslide victory in the general election. The polls capped a tumultuous few weeks during which the mayor suffered a series of setbacks, even as he dutifully checked off delivery on some campaign promises. In Albany, New York Governor Andrew Cuomo—like de Blasio, a Democrat—and his Republican allies blocked several of the new mayor’s initiatives, ranging from his bid for authority to set local wages to his request for traffic cameras for his flagship street-safety program, Vision Zero. Even his universal pre-K victory came with a caveat: while Albany had given de Blasio most of the money he wanted for his initiative, state legislators would not permit the city to fund the program through higher taxes on the rich, a linchpin of de Blasio’s campaign platform. They also skimped on funding for a key after-school component. At the same time, de Blasio was navigating drama closer to home. He got outmaneuvered by charter school proponents, drubbed for asking the police about a political ally’s arrest, and hazed in general by a voracious press. “What a small and politically vicious man New York’s new mayor is,” Peggy Noonan howled in a recent column attacking de Blasio on charter schools. De Blasio came to power by critiquing the “tale of two cities” that constituted the narrative of New York for the previous twelve years under the billionaire mayor, Michael Bloomberg. And three months into the de Blasio administration, this is indeed the best of times and the worst of times for progressives in New York. The good news is that city government is controlled by a progressive mayor who is actually sticking to many of his campaign promises and pushing an agenda of change. The bad news is that all the forces that have stymied progressive officials in the past—establishment pushback, mainstream media suspicion, political rivalries, fiscal realities and fissures in the progressive coalition—are as strong as was previously feared. Since the night de Blasio was elected in a blaring repudiation of the Bloomberg era’s excesses, he’s been more than just another mayor charged with getting the garbage picked up and drafting an annual budget. Many progressives named him the standard-bearer for a new, inclusive era of social justice politics—an urban retort to the Tea Partiers as well as the New Democrats. As the roller-coaster ride of de Blasio’s first 100 days comes to an end, the question becomes: Were progressives wrong to anoint him thus? Or is it possible that the twists and bumps of his first few months actually proves they were right? Well before he set foot in City Hall’s West Wing, Bill de Blasio was dogged by a stubborn meme, hinted at by the media and hammered at by his opponents. The cynical version was four words long: “Skillful politician. Lousy manager.” Yet in his first three months, de Blasio has somehow succeeded at both confounding and confirming the book on him. Shortly after the election, de Blasio began unveiling an administration stocked with experienced government managers, many of whom had significant ties to earlier administrations. Anthony Shorris, a longtime insider, is his first deputy mayor. His deputy for health and human services logged time in the Bloomberg administration, as did the schools chancellor, environment commissioner, and other chiefs and deputies. These selections were clearly meant to counter the notion that de Blasio was going to run the city by the seat of his pants. The appointment of Bill Bratton, the man who twenty years ago brought “broken windows” policing to New York, was not a home run with the new mayor’s progressive base, but it did make it hard for the right to paint him as soft on crime. At the same time, de Blasio managed a rough and snowy winter fairly well. There were complaints from East Side residents about one storm and, yes, from celebrity weatherman Al Roker about another, but these blew over quickly. Even so, the managerial record, though far from a failure, was not perfect. De Blasio’s transition remains a work in progress, with key posts like fire commissioner and head of the Buildings Department still vacant. The administration has been slow to give specifics on its plans for schools, housing and more. Privately, people on the left who have dealt with the administration describe a level of disorganization more typical of campaigns than governments. Where the de Blasio administration has faltered most seriously is in its relations with the press. There’s certainly been no shortage of dumb stories about the mayor, but his team has also been slow to respond to the realities of a contentious Fourth Estate. De Blasio has regularly showed up forty minutes late to press events and, in January, tried to sneak in a speech to AIPAC by omitting it from his official schedule. When WCBS-TV caught the mayor’s vehicle breaking traffic laws just days after de Blasio proposed sweeping street-safety improvements, the mayor first ducked questions and then issued a lame response claiming “security” as the reason he had to be driven so aggressively. If de Blasio has proved more able as a manager than the conventional wisdom predicted, his political instincts apparently failed to prepare him for the ambush that awaited when his Education Department dared to challenge the charter school establishment. In early February, de Blasio reviewed a set of late-2013 decisions by his predecessor on the sharing of public school buildings. He approved most of them, including most of the ones involving charters, but rejected three. It was a modest, judicious decision. Yet it exploded in his face. The tabloids screamed that de Blasio had declared war on charter schools. Pro-charter forces took to the airwaves with slick, distorted ads accusing de Blasio of turning his back on low-income people of color. And Governor Cuomo, eager to score election-year points, exploited the chaos with a surprise speech to a pro-charter crowd in which he vowed to “save charter schools.” It took de Blasio weeks to stop the bleeding, by which time his foes had built up enormous momentum in Albany. The state budget reversed the mayor’s co-location denials and all but eliminated his ability to curtail charters’ use of regular school space. It was a stunning defeat, one that almost managed to drown out de Blasio’s successes, most notably his skilled play for universal pre-K. De Blasio built his mayoral campaign around UPK as a way to erode some of the vast income inequality that has threatened the city’s ability to host an economically diverse population. He called for a $530 million program offering UPK and after-school programs in middle school, to be funded by a tax on people making more than $500,000 a year. In January, Cuomo offered a tepid endorsement of de Blasio’s plan, dismissing the tax idea and instead offering to fund UPK from general revenues, but at a dramatically reduced level. Many called for de Blasio to take Cuomo’s offer. The mayor instead continued to press for a temporary tax on high earners to fully fund his idea. In the end, de Blasio didn’t get the tax or all he wanted for after-school, but he did get three times the money Cuomo originally proposed. And this fall, de Blasio will roll out a program that offers immediate help to working families searching for high-quality childcare and a leg up to tens of thousands of city kids. Other political wins are also on the books. De Blasio scored an early victory by getting Melissa Mark-Viverito, a close ally, elected as City Council speaker, then pushed for the expanded sick leave that Bloomberg had fought tooth and nail, but which passed this year with little business-sector opposition. De Blasio also unveiled a 2015 spending plan with few signs of the “budget dance” that characterized most Bloomberg budgets. He proposed a municipal ID card, particularly useful for undocumented immigrants, which City Council members promptly introduced. He appointed a post-Sandy recovery czar and eased eligibility rules at the city’s homeless shelters, while winning state approval for a new housing program for shelter residents. He even skipped the main St. Patrick’s Day Parade to protest its exclusion of gay groups, a first for a sitting mayor. “He’s had some rough days, for sure, but it’s pretty impressive that in his first 100 days he’s already scored a big victory with pre-K funding and taken an important step in reviving the rental subsidy program for moving the homeless into permanent housing,” says Jonathan Bowles, executive director of the Center for an Urban Future. One victory involved housing benefits for people with HIV/AIDS. For years, advocates had complained that, because of a wrinkle in the law, tenants of the city’s HIV/AIDS housing program sometimes paid up to 70 percent of their income toward rent. This year’s state budget included an agreement between the city and the state to split the cost of whittling that number down to 30 percent. Sean Barry, executive director of VOCAL-NY, says de Blasio himself made the change a priority and spoke with Cuomo directly about it. “It contradicts the dominant narrative that he sort of fumbled his agenda,” Barry says. To mark his 100th day in office, de Blasio gave a forceful speech in which he laid out his vision for progressive government. “This administration is a product of movement politics,” he declared in his hourlong address. It was an unapologetically activist speech, a call to the city’s “grassroots” to create a “people-powered government” and, in the process, join him in the adventure of his next several hundred days. The challenges of this new phase are clear. Leading the list is the implementation of UPK, which, if bungled, could prove disastrous not only for the mayor, but for a valuable new social policy. 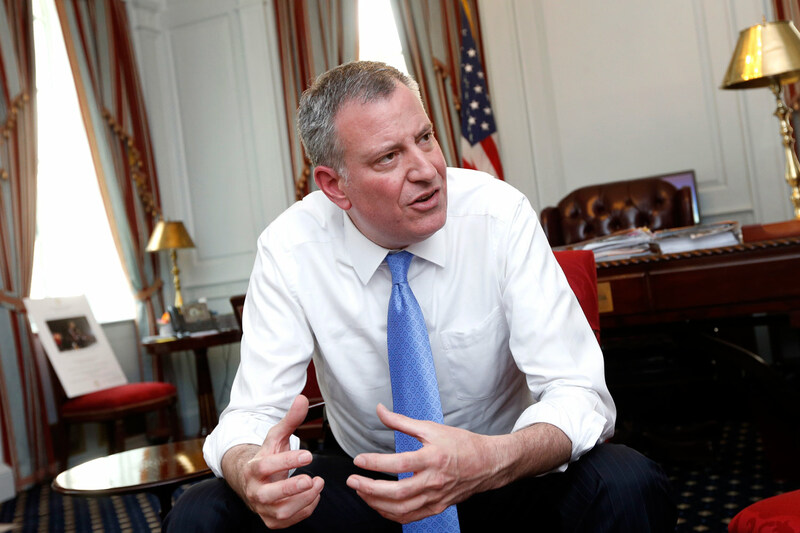 Another challenge is de Blasio’s relationship with Andrew Cuomo. While the city boasts massive economic power and a global profile, it is legally subordinate to the state. As a result, on any number of initiatives, whether it’s traffic cameras, rent regulations or the minimum wage, Cuomo’s blessing is essential—and, as he has demonstrated, readily withheld. De Blasio seems to have recognized this, telling the Times, “I think we are going to focus on what we can do for our own people, with our own tools.” Yet he can’t circumvent the governor on everything. There are other challenges. The mayor still has to settle a huge number of labor contracts with city workers, and do so in a way that keeps the city solvent. He must make progress against the inequality that he pledged to attack despite the limits to a mayor’s power, the scale of the forces feeding it, and the fact that UPK could take years to have a meaningful effect.